This document describes proposed best practices for transforming multilingual terminologies, particulary those available in TBX format, into a Linked Data version. The best practices are exemplified using the well-known IATE resource. The document describes the models and vocabularies to be used and describes the conversion using a running example. This document was published by the Best Practices for Multilingual Linked Open Data community group. It is not a W3C Standard nor is it on the W3C Standards Track. Source code for this document can be found on Github. This document provides guidelines on how to convert terminologies represented in the Term Base eXchange (TBX) into the Resource Description Framework (RDF). TBX is an open standard that has been published by the Localization Industry Standards Association (LISA). The standard is identical to ISO standard 30042. This document on the one hand describes the vocabularies that are recommended to be used in doing this conversion and describes the structure of the resulting RDF. It builds on standard W3C vocabularies and other vocabularies that are currently in the process of standardization. The conversion has been implemented in the form of a software package that can be used by anyone (see here). The following table provides an overview of the vocabularies used in the conversion. Most vocabularies are W3C recommendations or near standards developed by a working group. We have chosen the lemon-ontolex vocabulary as the backbone of the conversion of TBX into RDF format. 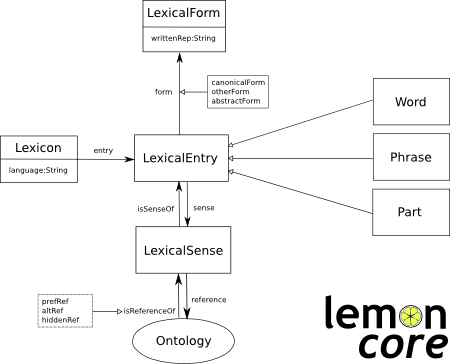 lemon-ontolex is a model proposed for representing lexical information relative to ontologies and for linking lexicons and machine-readable dictionaries to the Semantic Web and the Linked Data cloud. The lemon-ontolex vocabulary is currently under discussion by the Ontology-Lexicon Community Group that is currently in the process of issuing the final specification of the model. Nevertheless, the model is currently stable enough to build on it. 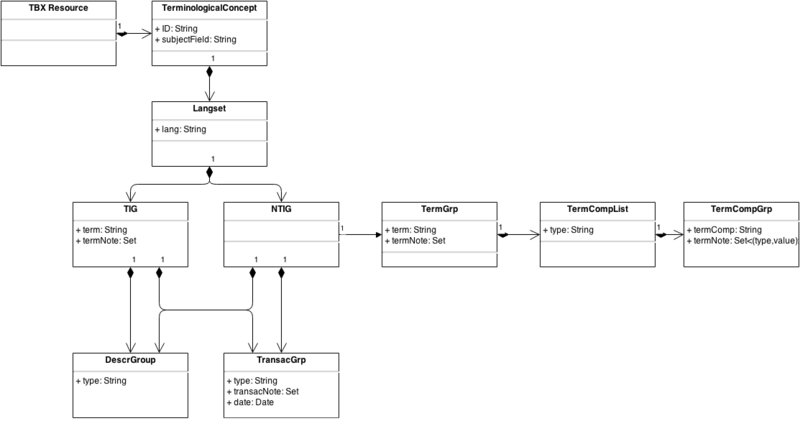 The TBX Data Model as an UML diagram. The following list provides an overview of the main elements of a multilingual terminology represented in TBX format. TBX Resource: A TBX resource essentially represents a collection of terminological concepts (“terminological concepts”), which are represented as XML elements of type termEntry and have a unique ID. In the XML snippet in Section 4.1, there is one terminological concept with ID IATE_84. Each terminological concept is described by a set of properties, such as a subject field they belong to. Terminological Concept (term entry): represents a language-independent concept. Each terminological concept is associated to a Langset (see below), which can be seen as a set of language-specific Terms that express the Terminological Concept in question. Langset: A langset is a language-specific container for all the terms that lexicalize a “terminological concept” in a given language. The Langset contains simple terms, for which no decompositions is provided (TIG), as well as complex terms for which the decomposition information is provided (NTIG). Term Information Group (TIG): represents a language-specific term for which no decomposition information is provided. Nesting Term Information Group (NTIG): represents a language-specific term for which decomposition information is provided. For a full specification of the TBX data model, please refer to TBX DTD . Lexical resources such as WordNet are one of the most important types of data sources for linguistic research. Such resources are complementary to another type of Web resources that contain a large amount of taxonomic data described in RDF such as DBpedia . Bridging the gap between these two types of resources means that rich linguistic information found in lexical resources (e.g., lexicons) can be used to describe information on the Web, enabling novel applications such as question answering over Linked Data . This leads to a new type of resources that is termed ontology-lexicon, which consists of an ontology describing the semantic and taxonomic nature of the domain and a lexicon describing the behaviour of the words in a language used to refer to the semantics captured by the ontology. A lexical entry, which may be a word, multiword expression or an affix, is assumed to represent a single lexical unit with common properties, especially part-of-speech, across all its forms and meanings. A form represents a particular version of a lexical entry, for example a plural or some other inflected form. A form may have a number of representations in different orthographies (e.g., spelling variants) or media (e.g., phonetic representations). The sense refers to the usage of a word with a specific meaning and can also be considered as a reification of the pair of a lexical entry used with reference to a given ontology. The sense is also used as a node for the annotation of many pragmatic features such as register. The reference is an entity in the ontology that the entry can be interpreted as, or alternatively that can be represented by using the lexical entry. TBX Resource: is not explicitly represented, the whole dataset represents the TBX resource. A TBX resource is thus represented as a void:Dataset, to which provenance and licensing information can be attached. Terminological Concept: is represented as a skos:Concept. The Simple Knowledge Organization System (SKOS) is a vocabulary for representing knowledge organization systems (KOS) such as thesauri, classification schemes, subject heading and taxonomies in RDF. The fundamental element of a SKOS vocabulary are concepts, defined as units of thought, ideas, meanings, or (categories of) objects and events, which underlie many knowledge organization systems. As terminologies can be seen as a special case of a knowledge organization system, using SKOS concepts to represent terminological concepts seems appropriate. TermGrp: the information about the morphosyntactic properties of a term is attached to the corresponding ontolex:LexicalEntry. The string enclosed in <term> </term> is assumed to be the ontolex:canonicalForm of the lexical entry in question. TermCompList: the decomposition of a term is represented using the ontolex:decomp vocabulary, creating a decomp:Component and a corresponding ontolex:LexicalEntry for each component. TransGrp/Transaction: a transaction that creates or modifies the term is mapped to a tbx:Transaction (a subclass of prov:Activity). Provenance metadata is attached to this entity. The prov:Activity related to the responsible person or agent through prov:wasAssociatedWith; the relation to the responsible Agent is encoded via prov:wasGeneratedBy. In this section we illustrate the transformation by providing one running and real example taken from the IATE terminology. This is an excerpt of a TBX file downloaded from the IATE website. Address any enquiries to iate@cdt.europa.eu. @prefix cc: . @prefix : . @prefix void: . @prefix skos: . @prefix rdfs: . @prefix tbx: . @prefix gr: . @prefix dct: . @prefix rdf: . @prefix ontolex: . @prefix ldr: . @prefix odrl: . @prefix dcat: . @prefix prov: . : a tbx:MartifHeader , dcat:Dataset ; "This is an excerpt of a TBX file downloaded from the IATE website. Address any enquiries to iate@cdt.europa.eu." ; dct:type "TBX-Default" ; tbx:encodingDesc "
The term entry in lines 14 -18 would be represented in RDF by a skos:Concept in RDF. :IATE_84 a skos:Concept ; tbx:subjectField "1011"^^tbx:subjectField . <http://tbx2rdf.lider-project.eu/data/iate/en> a ontolex:Lexicon ; ontolex:entry :competence+of+the+Member+States-en ; ontolex:language "en" . :competence+of+the+Member+States-en a ontolex:LexicalEntry ; tbx:reliabilityCode "3"^^xsd:string ; tbx:termType tbx:fullForm ; ontolex:canonicalForm :competence+of+the+Member+States-en#CanonicalForm ; ontolex:language "en" ; ontolex:sense :competence+of+the+Member+States-en#Sense . :competence+of+the+Member+States-en#CanonicalForm ontolex:writtenRep "competence of the member states"@en . :competence+of+the+Member+States-en#Sense ontolex:reference :IATE_84. Note that the entry specifies the reliability code (i.e. 3), the type of term (i.e. full form), the canonical form (i.e. competence of the member states), and the language (i.e. en). Each lexical entry is assumed to have a LexicalSense that represents the meaning of the entry. In this case the meaning is established by reference to the terminological concept :IATE_84. We would generate a similar entry for German, which is identified as :Zust\%C3\%A4ndigkeit+\-der\-+Mitgliedstaaten-de and is an entry in the corresponding German lexicon. Note that both entries have a reference to :IATE_84 and are thus cross-lingual equivalents. :Zust%C3%A4ndigkeit+der+Mitgliedstaaten-de tbx:reliabilityCode "3"^^tbx:reliabilityCode ; tbx:transaction	:Transaction . :Transaction a prov:Activity , tbx:Transaction ; tbx:transactionType "origination"@en ; prov:endedAtTime "2014-05-08"^^<http://www.w3.org/2001/XMLSchema#date> ; prov:wasAssociatedWith :Agent . :Agent a prov:Agent ; rdfs:label "PC" . As a proof-of-concept for the conversion, we have converted the IATE (InterActive Terminology of Europe) into RDF format. The data is available here. We have also converted the European Migration Network glossary. The data is available here. In order to show how the model can be used, we give a number of queries that demonstrate data access to the model. As additional input to the program, a file can be provided that contains mappings of specific XML elements and attributes used in the TBX document to URIs representing properties. If no file is specified the default file "default.mappings" is used. This option is only available when directly executing the Java program, not via the Web service. A service for converting TBX to RDF is available here. The authors would like to thank the BPMLOD community group members for their valuable feedback. Special thanks to Guadalupe Aguado de Cea (UPM), Christian Lieske (SAP) and Tatjana Gornostaja (TILDE).